I’ve finally managed to catch up with this film after hearing only good reviews from esteemed journalists and friends. So let’s say my expectation were fairly high (which is always pretty dangerous). On the whole I was a bit disappointed by how average it all was. 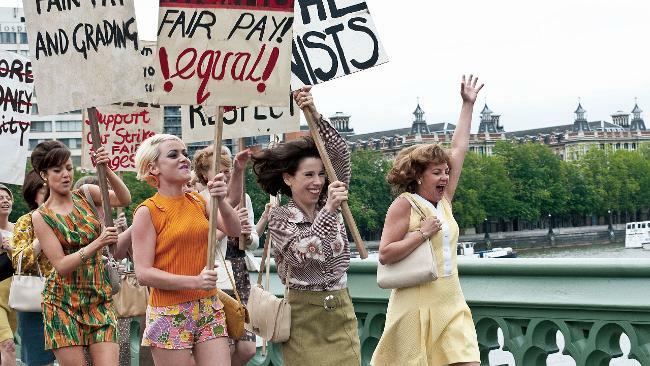 To be fair, the story itself is the best thing: how a group of female workers at the Ford Dagenham car plant decided to go on strike protesting against sexual discrimination and asking for equal pay. It’s not just interesting and quite gripping but it’s also unbelievably true… Even more unbelievable to think that all this was just 40 years ago. Unfortunately, the story itself, as you can see, can be told in about a sentence or two. So after a while the film actually drags a bit and plays out pretty much as expected, by numbers. It is a typical British film in a way: its pace, its gritty locations, its gray colours, even weather itself is very British. Nothing wrong with that, of course, expect this is all really superficial. The direction is pretty nonexistent and misses all the right moments. So much so that the supposedly funny scenes are without laughter and the moments where you should feel something (maybe even cry) are so cold and contrived that you’ll end up feeling absolutely nothing. The script pretty basic and actually quite weak in places. There are scenes in which characters reveal their true motives to each other, in the lamest and laziest way, with dialogue that rings so annoyingly untrue, even though it’s all supposed to be a real story: for example the scene where Bob Hoskins tells, out of the blue, that the reason why he wants to help out is because his difficult childhood, is really contrived! And then later on in the film, there’s a very similar moment in which Rosamund Pike (who at least is good with the little she’s been given) tells Sally Hawkins how she feels. My God, do people really talk like that? It’s funny how they managed to make a true story seem to un-real! Even Miranda Richardson‘s depiction as the Secretary of State is so over the top that you almost wonder whether she’s even realized she’s not on a Harry Potter set anymore. Almost every single character in this film is a two-dimensional caricature, purely functional to the story: they can all be described with one adjective each. Most of the men act as the baddies, as if they were performing to 5 years old children, in the most ludicrous way. Was that really the only way to make the women appear stronger in the film? The only one who attempts to do something a little bit more interesting is Richard Schiff, but unfortunately there isn’t enough of him to make him an interesting character anyway. Once again, the Bob Hoskins‘s character (A union shop steward) is a one-dimensional one too. The moment where he quotes Carl Marx, is just one of the several contrived moments in the script, aiming for an easy punch-line, but actually contributing to make it even more un-real . Are we really supposed to believe that a character like him, really knows Carl Marx by heart? Not to mention all the silly subplot which, on paper should really make the characters more real, but in practice end up being “so what?” moments. For example, what’s all the business with that woman with the sick husband (and the suicide too!!)? How is that meant to fit into the story? Are we meant to feel something for her? Because if that’s the case, I didn’t really feel anything about it. And what about all the stuff with the bullied son at the beginning? Why is that subplot even there at all? It’s a real pity, because a story like that really deserved something a lot better than this film.